Successful social movements around the world have all included a DIVERSITY of styles of action in order to influence or cause change. To build a successful social movement, it is absolutely necessary to look at and study successful social movements around the world, current and historical, to see what worked and what didn’t. Consistently, social movements are most successful when the diverse methods used by a broad based people’s movement are, at least somewhat, unified and coordinated towards their common goals, despite ideological or strategic differences. Social movements become weak and fail when they begin dividing into ideological and strategic camps that fight against each other. The basis of assessment of effective tactics for Indigenous decolonization movements should not be: is this action peaceful or violent? It should be, is this action effective at generating power? In terms of understanding global social movements, North Americans are disadvantaged because of the dominance of the Peace Movement, which although practically non-existent today, continues to define the historic lens through which global social movements are viewed. The Peace Movement in North America has historically been defined by white middle class settlers. Their racist, classist viewpoint of the world has distorted their interpretation of the role of pacifism in people’s liberation movements. Indigenous people of North America today have an opportunity to NOT repeat this problem. It is strategically flawed and historically untrue to promote the idea that peacefulness is what makes liberation/resistance movements successful. All successful liberation movements have been made of a diversity of ideological, strategic and tactical elements. For example, when pacifists cite Mahatma Ghandi as the leader of the Indian Independence movement, and emphasize Satyagraha, or passive resistance, as the reason for it’s success, they are factually and historically wrong. They omit Bhaghat Singh, who is considered a leader of equal stature of a parallel but armed and militant, violent uprising. Because pacifists revere Ghandi and completely omit Bhaghat Singh, they also fail to comprehend the complexities of Indian Society and the Indian Liberation movement. Another example: the Black Civil Rights/Black Power parallel movements in the U.S. as characterized by Martin Luther King Jr. and Malcolm X. To say that either one was less influential in combating white supremacy in the U.S. is laughable, and insulting to the complex history of African people in America and African Americans. Yet by condemning violence and upholding pacifism as the only respectable method of protest, the North American Peace Movement pits two equivalent sides of the Black liberation movement against each other. Martin Luther King Jr. is revered and Malcolm X is reviled. Another example can be seen in the North American pacifist version of the South African Anti-Apartheid Movement. Nelson Mandela is revered as an icon of passive resistance. And passive resistance is upheld as the reason Apartheid was dismantled. Yet, in real history, available for all to read in any library or online, the Anti-Apartheid movement itself involved a multi-layered resistance movement of legal, non-violent, and armed militant action. Mandela himself, at different times, led both non-violent and militant violent protests. The Zappatista Movement serves as another example of a multi-dimensional people’s liberation movement. On December 21, 2012, tens of thousands of Zapatistas in Mexico silently walked through villages and towns and congregated en mass in quiet orderly rows. This action was the quintessential definition of peaceful dignity. 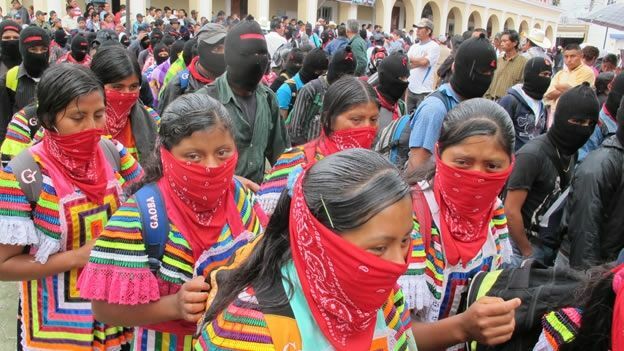 But the underlying message, given that the participants all wore masks or the balaclava and scarves that have come to signify the Zapatista movement, conveyed a stern message of militancy, commitment and organization. The Zapatista movement has always been comprised of social, non-violent and armed, organized militant components. To condemn violence, is to condemn all of those thousands of men and women who marched in silence that day. When it comes to North American Indigenous people, Settler pacifists uphold Native spiritual values and social and environmental ethics as great models of peacefulness. But real Indigenous resistance to genocide involves a complex resistance movement that involves legal, social, non-violent, militant action and open warfare. Currently, there has been an astounding upswing of Indigenous activism that was sparked nationally because of changes to the Canadian Indian Act that accelerate the extinguishment of Indigenous title and rights to lands by eroding what little is left of Treaty agreements. The Treaties are viewed as a flawed but vital protection Indigenous people have against further encroachment of colonization onto Treatied territories. A group that is taking the lead of this surge of uprising is Idle No More (INM). INM leadership is promoting a strictly ‘peaceful’ protest movement. Although this 'peacefulness' is vague and undefined, it is promoted as being the ‘native way.’ Yet, the very Treaties this movement is focused on are based on the Royal Proclamation of 1763. The signing of the Royal Proclamation was largely influenced by the open warfare of Pontiac against the English at that time. To say that peacefulness is part of Indigenous traditions is accurate, but to say that the Native Way is inherently peaceful is historically and traditionally untrue. Indigenous resistance to colonization can never be homogenous because North America is comprised of hundreds of distinct Indigenous groups that have different histories, and different cultures. And, within each group are many smaller groups of independent decision making bodies. In addition to this cultural and geographic diversity, Indigenous people have always utilized many different forms of resistance. The term “by any means necessary” has never been so widely applied outside of Indigenous decolonization movements: Native people use silent prayer and meditation, ceremony, social gathering, child rearing, education, protest, law reform, the United Nations, boycotts, civil disobedience, land re-occupations, armed standoffs, sabotage, blockades, street marches, riots, guerrilla warfare, hot lunch programmes, fashion shows, music and art, hunting and fishing, growing gardens, collecting medicines, getting a university education, building a traditional home and living off the land, cross continental runs, alliance building, and the list could go on. To dismiss or condemn any one of these powerful moves to counter colonization and genocide is to cut out chunks of the holistic fabric of Indigenous survival. Out side the lens of North American Pacifism, successful peoples’ liberation movements can be seen clearly as being diverse and complex. And the interplay and inter-dependance between these different, and even conflicting, elements has contributed to the success of the movement as a whole. In contrast, divisions between ‘peaceful’ and ‘violent’ aspects of social movements are detrimental and likely to cause failure in the pursuit of the movement’s goals. Social movements are vulnerable to weakness when the different components fail to coordinate their efforts, and when they fight amongst each other for dominance instead of building on each other’s strengths. They are also susceptible to deliberate state intervention exacerbating conflict. Yet, amongst the necessity of diversity, some kind of general agreements around timing, escalation and coordinating action is necessary. This coordinating effort is often highly volatile and conflictory within social movements. And often revolves around tactics and styles of action. To minimize the division these conflicts cause, it is helpful to understand the nature of political action in the first place. Why do social movements take 'action'? All social movements use action to build leverage for themselves to counter the power of government or corporate force. Leverage: leverage in the context of social movements, means the power the people have to alter the conditions of their lives, to influence governments, societies and corporations to change, or to force hostile governments/corporations to start doing something beneficial or stop them from doing something harmful. The concept of building leverage counters the concept of democratic process. In an ideal democracy, people don’t need leverage because they are engaged in a equalized environment where their opinion and voice matters. But, as can be seen by simply looking around, this is not true of the democratic process within the state of Canada. Voicing dissent can have some effects on government policy and corporate activity, but it clearly has an extremely limited effect. In order to amplify the effects of the voice of dissent, people have devised all sorts of creative methods to force governments to listen to them, and further, to take action to benefit the quality of their lives. The acquisition of leverage is the MAIN GOAL of all social movements that have ever occurred on the planet Earth. To deny or ignore this basic foundational fact is to lose the race right out of the starting gate. Social Movement building and political activism is 100% about gaining leverage in order to influence or force opponents to make changes. To re-orient this focus towards a singular and ideologically based tactic is not a useful way to propel a broad based social movement. For Indigenous survival, and increasingly, the survival of the planet, is it not strategically viable to limit action to one singular thread in the infinite possibilities of human creativity and ingenuity. The goal of the candle light vigil is the same as the road blockading encampment; the round dance at the mall has the same goal as the pick-up truck parked across the railway tracks: to generate people power to counter the brutal force of state power. When action is viewed as the process of generating power to affect beneficial change, it can be assessed in the objective light of effectiveness, instead of being limited and derailed by ideological prejudice. The basis of assessment of effective tactics for Indigenous decolonization movements should not be: is this action peaceful or violent? It should be, is this action effective at generating power? - it is generated by people taking action. All modern social movements involve many tiers or styles of leverage building, which can be viewed in a spectrum of confrontationality: social capacity building, voting and electoral politics, law reform, public displays of dissent, civil disobedience, non-violent direct action, property destruction and sabotage, armed conflict, open warfare and insurgency. In there as well are strikes –including pickets and work stoppages. Strikes can fall anywhere in the realm of legality depending on the specific situation. Indigenous people within the state of Canada must develop and maintain a basic understanding that the real history of global social movements as one of diversity and interdependance and build our de-colonization movements accordingly. One of the great unique strengths of Indigenous social movements has been the capacity to accept diverse types and tones of action. There is a grave danger in the recent upswing of Indigenous uprising centred around the Idle No More Movement to enforce a ‘legal’ and ‘peaceful’ doctrine to the social movement as a whole. This tendency goes against the past 500 years of resistance to colonization that Indigenous people have achieved, and specifically, it works directly against the efforts of Indigenous activists over the past 30 years to build and maintain an active, diverse de-colonization movement. The great strength of Indigenous social movements has never been a homogenous unity. The great strength of Indigenous social movements is the over arching capacity to work towards a common goal, while accepting and encompassing each other’s differences. I welcome a frank discussion on the history and effectiveness of direct actions by indigenous groups resisting colonialism, including those who armed themselves. I am certain any court would agree that this kind of expression is well within the bounds of constitutionally-protected speech. However, our state does draw a line at speech used to incite armed uprisings. You would be wise to select your words carefully when writing on this subject, especially when it is apparent that considerable sympathies exist for the Idle No More movement. Given what we know of state repression of activist groups in Canada, one should not presume one is not a potential target of repressive government activities. Even the mere threat of legal action against you can be financially draining, and therefore an effective tool of intimidation by the state. Any legal action taken against you, even ones that you ultimately win, will still be a drain on precious time and resources of the activism community. There is no sense in needlessly exposing one's self to attack via the legal system, due to your use of ambiguous language in a sensitive context. "But real Indigenous resistance to genocide involves a complex resistance movement that involves legal, social, non-violent, militant action and open warfare." One would fairly interpret this as meaning, "in reality, historically effective indigenous resistance movements have typically included a wide array of tactics, including a resort to the use of force." I assume this is what you meant. However, one could not implausibly claim your meaning was : "REAL indigenous movements [i.e. ones of any value, or of any genuine substance] are the ones that resort to the use of force". This could be interpreted as a call to arms for the Idle No More movement. Someone might claim you are goading an audience of resisters into violence by telling them, "if this movement is legitimate [and/or is to be effective], it must also engage in open warfare." You may think it's a strained interpretation that has no merit, but if a judge decides it has even surface plausibility and doesn't immediately throw it out, then you face having to waste a lot of time inside a courtroom (or worse). And don't assume a legal victory will be some kind of worthwhile propaganda coup for you. I would not choose to assume the current government will not take an opportunity to suppress a growing social movement, if it sees one. I would also not put my faith in assuming every judge will be evem-handed. Some conservative judges certainly have sympathies with more hard-line stances to First Nations, and would like to see this movement defeated and to receive no concessions. Some judges are also simply racist. It's not a chance anyone needs to take. This is all totally avoidable by simply taking pains to be clear in your writing and avoiding needless ambiguity. I hope that you be careful, and that you encourage other writers to likewise.